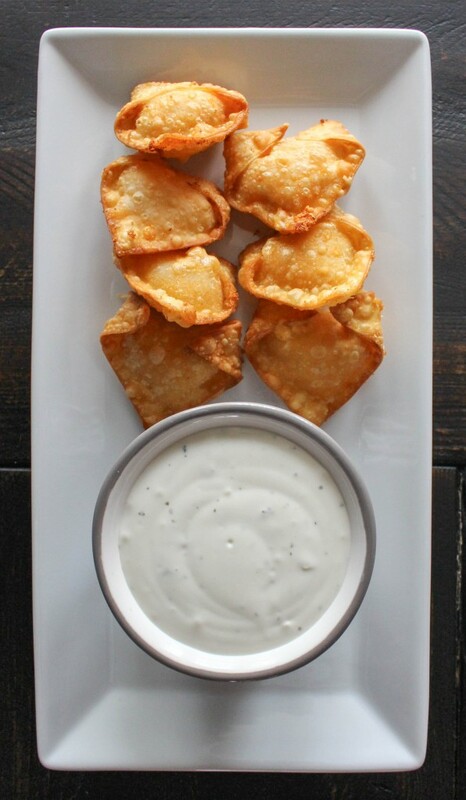 I’m going to be sharing some of my favorite football snacks with you this week. Here’s the first installment! It probably comes as no surprise that I’m sharing a buffalo chicken recipe as a Super Bowl snack idea. Not only do I LOVE the flavors of buffalo chicken (clearly), but you just can’t beat the classic when it comes to tailgating, watching sports, etc. Admittedly, I am not big on deep frying things at home. It’s a little bit scary to have a vat of hot oil on the stove when you’re as accident prone as me. Also, it can make a mess. And then there’s the question of what to do with the oil when you’re done using it. Stressful. I do, however, make an exception for special occasions. The Super Bowl definitely counts as a special occasion, in my book. Whether or not your favorite team made it, it’s still a fun event to tune into. The snacks, drinks, and COMMERCIALS make it! 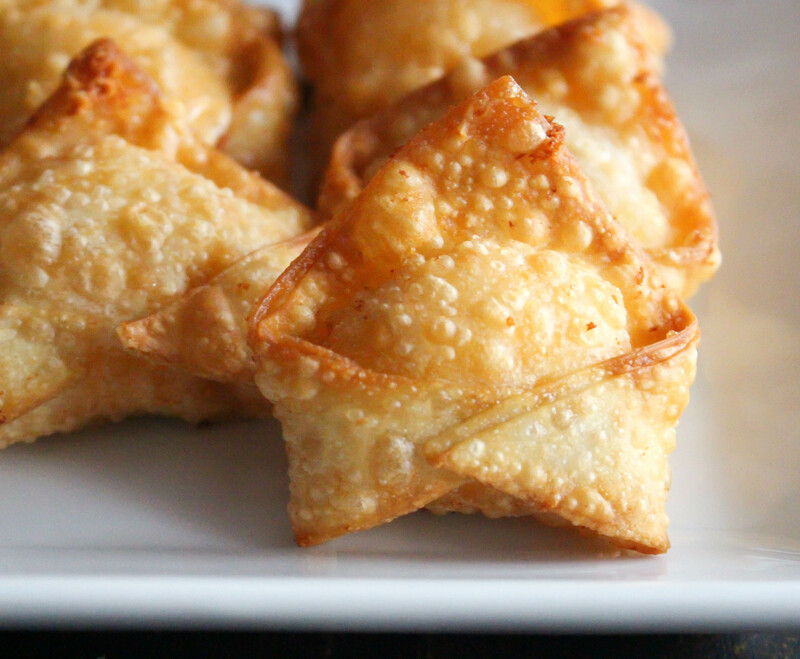 These wontons are incredibly addicting. They are super crispy on the outside and gooey and oozy on the inside. So yummy. One of my good friends is a vegetarian, and she asked me how to make a veg version of these. I think that these would still work if you just omitted the chicken altogether. The cheese and buffalo sauce will still make it a tasty bite. Also, if you’re really not into frying these guys, you could try baking them. I would brush them with oil or butter and put them in a pretty hot oven (maybe around 375-400°F?). I THINK they should crisp up nicely for you. 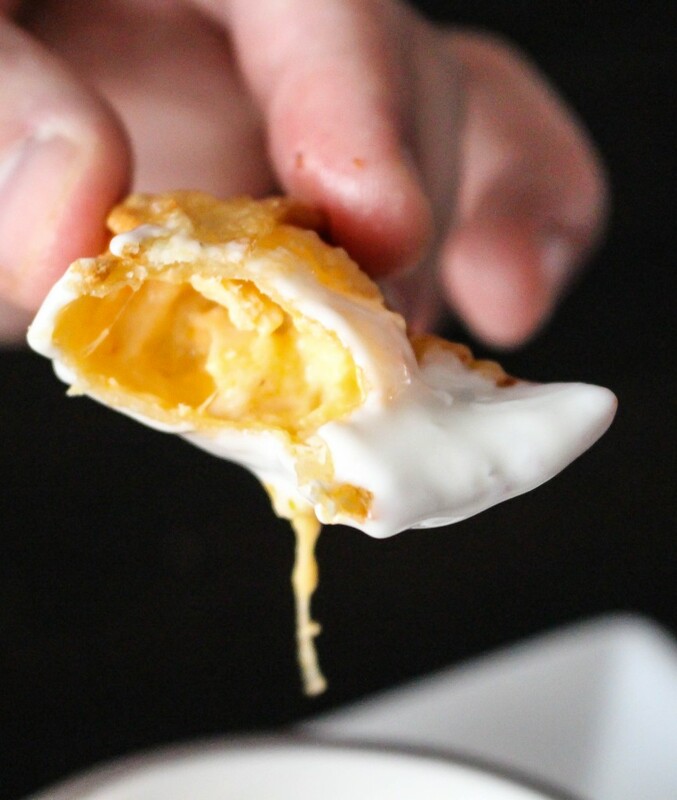 Nothing quite beats the occasional deep-fried treat at home, though. So crisp. So gooey. So delicious. Put these out for a party or make a batch for yourself – you’ll be surprised at how quickly they disappear. Combine the chicken, wing sauce, dressings, and cheeses in a large bowl. Mix until well combined. Taste for seasonings. Spoon about a teaspoon of mixture into each wonton wrapper. Moisten edges of wrapper with egg wash and bring together in the middle, forming a little purse. 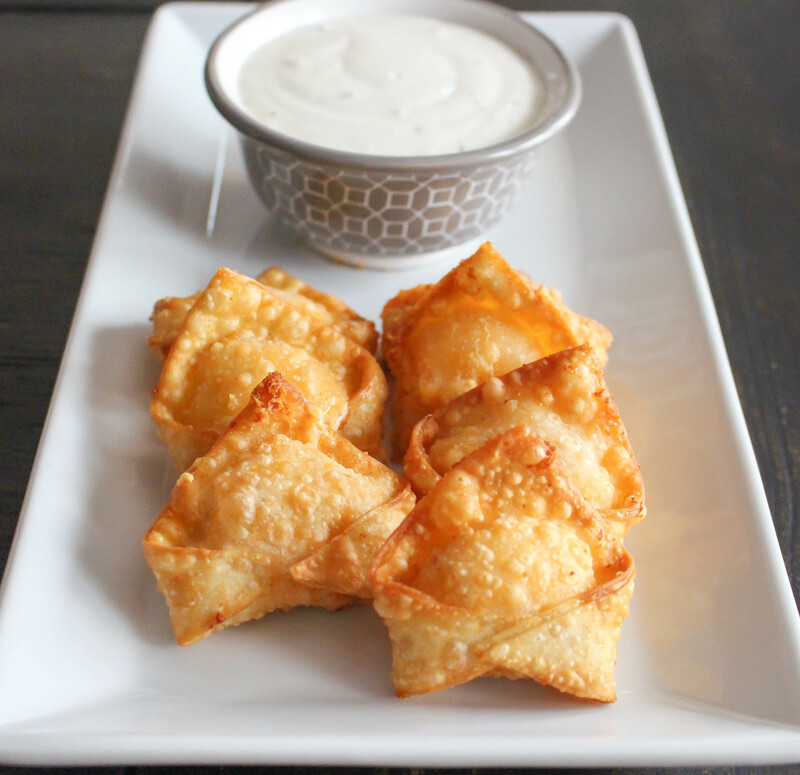 Place formed wontons on a baking sheet lined with parchment paper. Heat oil in a large, heavy-bottomed pot until temperature reaches about 350°F. Add the wontons to the oil in batches and fry until crisp and golden, about 2-3 minutes total. Drain on paper towels and repeat with remaining wontons. 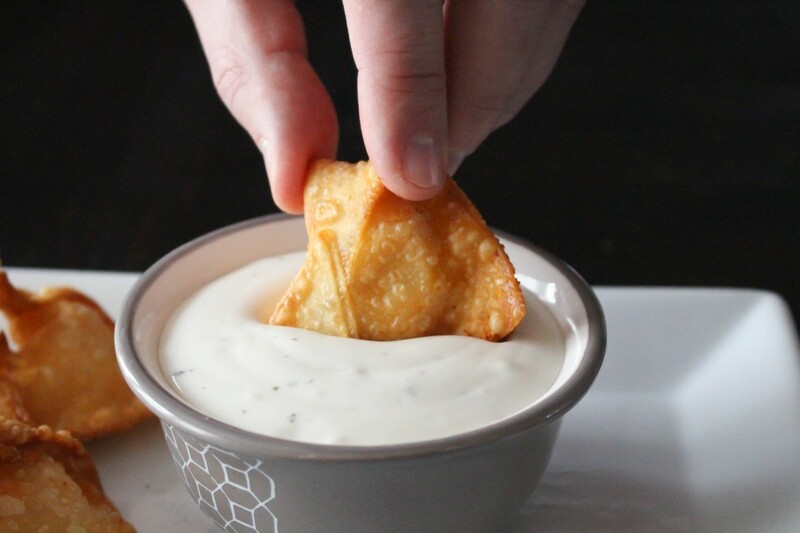 Serve warm with desired dipping sauces. 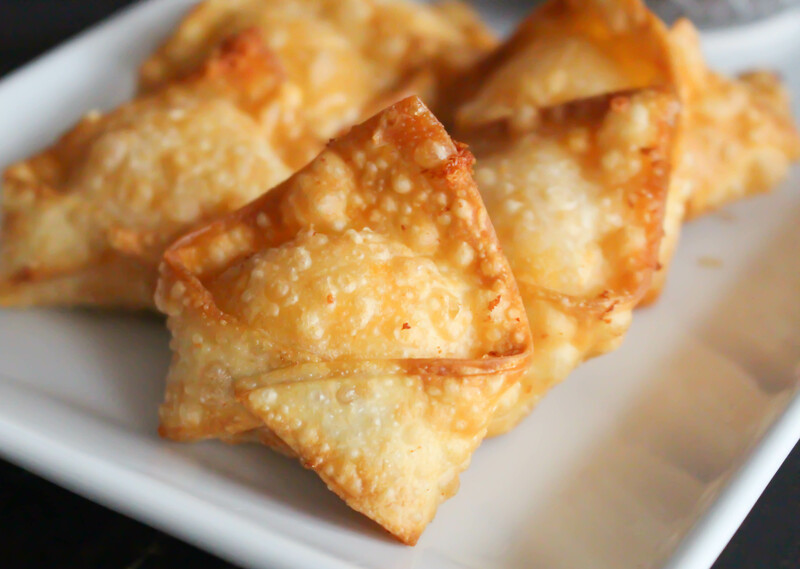 If making ahead, you can reheat the fried wontons in a 350°F oven for 10-15 minutes. Made these and they were a huge hit! So glad to hear! You can’t really go wrong with deep-fried buffalo chicken dip!